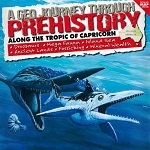 The Capricorn Caves are a living laboratory displaying dramatic climate change. Evidence of these changes can be seen in the stunning rock formations, their inhabitants and the fossils of creatures who did not survive. 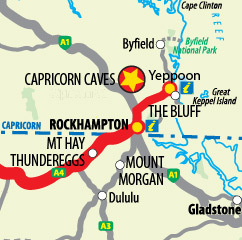 Australia has about 10,000 known caves, each unique, however these limestone caves are particularly special because of their elevation above the surrounding plains and their location on the Tropic of Capricorn. Caves usually form when water passes along cracks or layers in limestone or carbonate rocks, because of their water solubility. Limestone dissolves more quickly in acidic water, which occurs naturally when rainfall combines with carbon dioxide in the atmosphere. As water soaks through the soil it becomes even more acidic, when it interacts with roots and decaying plants and animals. Over time a large volume of acidic water can dissolve enough limestone to produce caves. Fossil deposits found in cave sediments on nearby Mount Etna, reveal an astonishing number of species. They help us to understand the role climate change has had on the diversity and extinction of our rainforest habitats. This giant ringtail possum was about the size of a modern Koala. Pseudokoala inhabited the ancient rainforest canopy and feasted on leaves and flowers. < This majestic marsupial lion was the largest mammalian carnivore ever found in Australia. It had massive meat-cleaving teeth and a pouch! These ancient southern crocodiles became extinct sometime in the late Pleistocene (180,000-30,000 years ago) and their fossils are evidence of a time when large reptiles ruled the region’s rainforests. This huge goanna may have been the Australian relative of the modern Komodo Dragon and inhabited the area over hundreds of thousands of years. How can I Experience the Caves? Summer Solstice Special Experience the incredible visual impact of direct sunlight penetrating through a vertical shaft to illuminate underground darkness. This phenomenon is visible only at midday in December and early January when the sun and the earth are aligned over the Tropic of Capricorn. Allow the experts to guide you through the labyrinth of chambers, weaving and winding your way through the breathtaking and surreal geo environment. There is a cave tour to suit everyone. 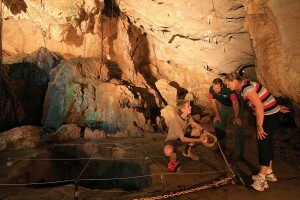 Visit the Capricorn Caves for guided and adventure cave tour information (Phone: 07 4934 2883).